For centuries people and organizations have tried to ban books and other materials ranging from the Bible to Harry Potter. Every September librarians put up displays for Banned Books Week in order to celebrate freedom of speech and our freedom to read. But, censorship is not one size fits all, nor is it always noticeable. Even though I work in a library I never thought I would encounter and have to fight against censorship. I work with the journals at Collins Memorial Library. All of the issues of the Wall Street Journal, Beijing Review, and Public Policy and Aging Report come across my desk. I am used to contacting publishers about missing issues, but over the past year I dealt with something I never had to deal with before. In May 2017, instead of the new issue of Der Stern, a German news magazine, we received a yellow postcard from the publisher. It said that the issue “was not made available for export to the USA.” I thought that was unusual, but set the postcard aside and went about my work. In August, we received another yellow postcard instead of the new issue of Der Stern. This time the yellow postcard really got my attention. I had been reading and hearing about the cover of the missing issue for the past week. In news outlets across the United States people were talking about the controversial cover. An image of the cover was available, but the magazine would not be available for export to the United States. I still was not sure how to handle the situation so I once again set the postcard aside and went back to work. In late November, a discussion of the missing issues of Der Stern began on a librarian listserv. Another library had received a third yellow postcard. Librarians at various institutions reached out to distributors and to the publisher. While waiting for the responses I received an email from the company who handles our subscription. They were able to arrange for us to receive the missing November issue, number 47, but were unable to get copies of the other two issues. I heard back from other librarians who had heard that one of the distributors was not sending the issues because they feared they would be sued. Apparently, the issues were being censored by the distributor. This is the cover of issue number 47. It is unclear who the distributor thought would sue them, but President Trump is on the cover of two of the censored issues. 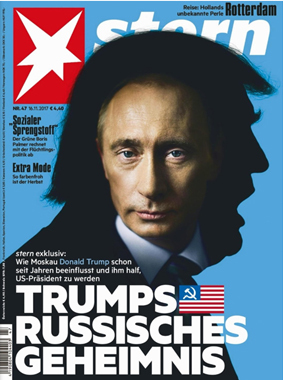 The cover story of issue 47 is titled “Trump’s Russian Secret.” The controversial August cover was a picture of Trump draped in the American flag, arm raised in the Nazi salute. The cover was in response to President Trump’s response to the violent actions in Charlottesville, VA. In my opinion, having issue 47 in our library is a symbol of the freedom of speech this country was founded on. Part of a librarian’s job is to fight against censorship, in whatever form it takes.